Finding it hard to be grateful just sitting around in your home? If offering gratitude for having a roof over your head doesn’t move you then get out of the house and take in the world around you! I had a rare day off this past Sunday, so I loaded the pups into the car and made the short drive to one of the many area parks near me. The joys of living in San Diego – there is so much to do that takes no money! Mast Park has a dog park, but we skipped that this time and took the Mast West Trail for a 2 mile walk. 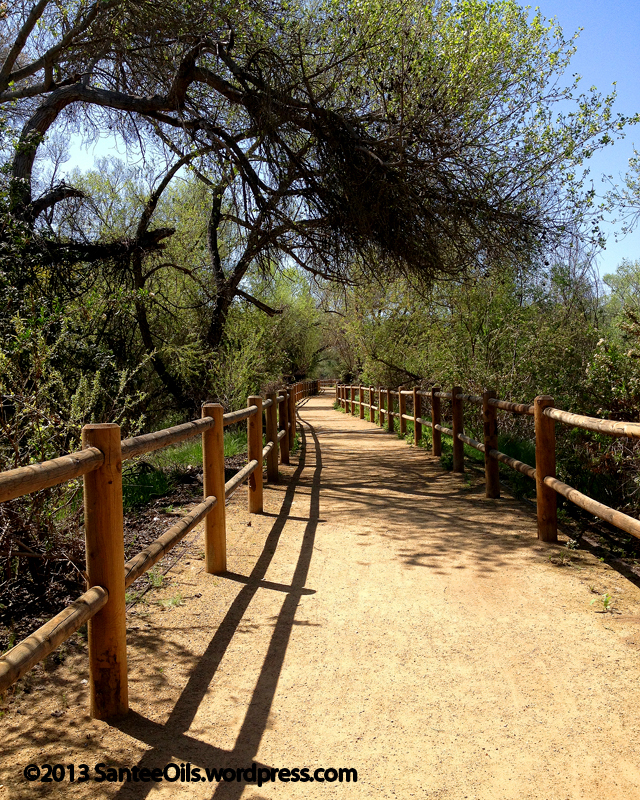 I was grateful for the park, for the beautiful day, for having a car to get me there and for the ability to walk the trail! I spent a year not being able to walk more than a couple of steps without major pain, after an unfortunate car accident. Hiking this trail was an absolute delight compared to that time in my life. Bennett and Indie had a blast too – add to my list being grateful for two such wonderful dogs! They make me smile when I am down, get me out of the house and moving when I’m too “blah” to really do anything and snuggle up to me when I am sick. They are spreading the joy too, as they are both working on their certifications to be full-fledged Therapy Dogs. Is something getting in the way of your taking a walk down the street to enjoy the sights? Then go as far as your front porch step and take a look around. My roommate (yes, I’m grateful to her too! She gave me a place to stay when my finances crashed and the friendship grew from there) has a wonderfully eclectic container garden in the front “yard”. Our yard is huge, but it is cemented over so containers are the way to go. I love that everything blooms at different times of the year, and that she lets me contribute to the gathering of beautiful plants. I brought these Narcissus blooms into the yard last year. I love the bold colors and the fragrance is just heavenly! These are located between the front gate and the front door and are a friendly greeting when I arrive home. The theme of bright colors is repeated throughout the yard with differing varieties of Geranium plants. Later in the summer the colors will be softer, but just as varied with the assorted Plumeria that have been planted over the years. In the back of the house there is a large fence that is absolutely COVERED in pink Jasmine blooms – talk about fragrant! The delicious smell wafts to the front yard with every breeze. And now that the nights aren’t as cool I have the windows to my bedroom open and the whole room smells of Jasmine blossoms. Yesterday I took my usual mile walk and in the final stretch coming home, I saw someone had written on the sidewalk “Enjoy!”. It looks like I’m not the only one looking for ways to spread my gratitude. It brought a smile to my face and I hope others had the same reaction when they read sidewalk art. Gratitude seems to be a theme popping up for me at the moment. Last night I went to a women’s networking dinner meeting, and the speaker for the night has a blog called The Gratitude Gardener. While her talk was more about marketing your business and showing your appreciation (aka gratitude!) to clients – the information and stats were great – I found myself drawn to her blog. Take a look for yourself and see if it doesn’t inspire you as well. If you would, take a moment and let us all know in the comment section: what are YOU grateful for today? Thank you for reading! 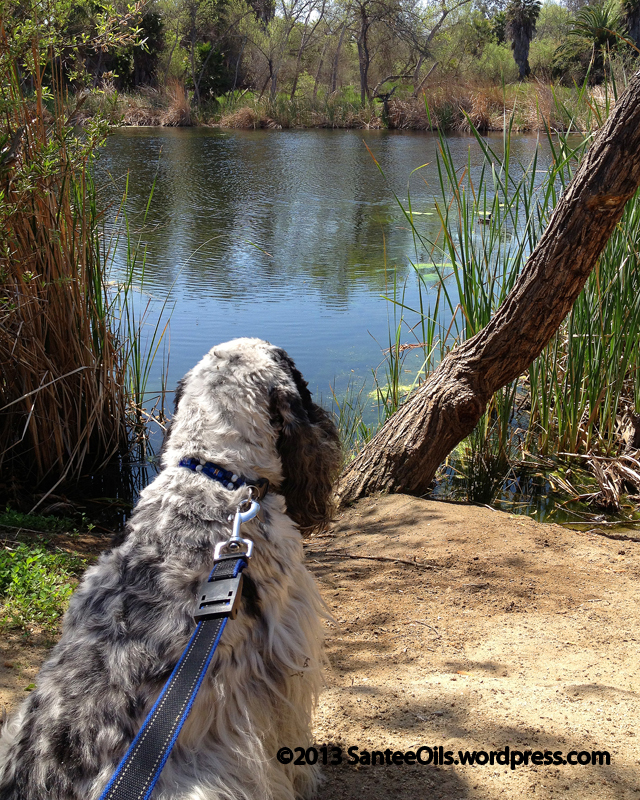 Bennett the Cocker Spaniel has his own Zen moment at the San Diego River in Mast Park. Gratitude. Mirriam-Webster dictionary defines this noun as “a state of being grateful. Thankfulness.” But what is it really? What is it to you? Basic science says that Gratitude is important for our daily health. 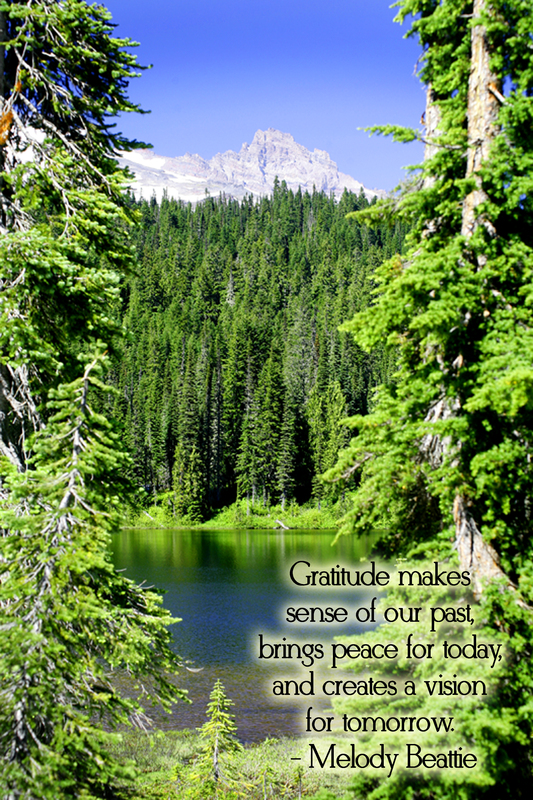 A post on Psychology Today’s web site says “gratitude not only can be deliberately cultivated but can increase levels of well-being and happiness among those who do cultivate it. In addition, grateful thinking—and especially expression of it to others—is associated with increased levels of energy, optimism, and empathy.” How about that! More energy and happier thinking without a pill! In a related article, Alex Korb PhD writes of a study done by researchers at the National Institute of Health “They found that subjects who showed more gratitude overall had higher levels of activity in the hypothalamus. This is important because the hypothalamus controls a huge array of essential bodily functions, including eating, drinking and sleeping. It also has a huge influence on your metabolism and stress levels. From this evidence on brain activity it starts to become clear how improvements in gratitude could have such wide-ranging effects from increased exercise, and improved sleep to decreased depression and fewer aches and pains.” They also found that expressing Gratitude stimulates dopamine production (that “feel-good” chemical in our brain) for an instant “Ooh! That’s NICE!” reward. Which programs us to repeat that act of Gratitude. It’s a nice circle to be caught up in! On an emotional and spiritual level, Gratitude is also rewarding. It opens our hearts and souls, as well as our brains, to the wonders around us – large and small. And while it’s a habit that takes a little practice before it starts coming naturally, it’s a habit that is worth the practice. The rewards are tremendous! I started my Attitude of Gratitude as an occasional thing: trying to look at major challenges for the little “on the bright side …” lessons they might offer me. For example: I had an ill-timed sneeze while driving on a busy surface road and rear-ended a car ahead of me. Everyone was safe (for which I was immediately grateful) but since my airbags went off, my car was deemed totaled and insurance paid off the balance of my payments due. A wonderful friend sold me her old car (same make and model as the one I lost that day, just quite a few years older) for a whopping $1.00. That was in August of 2005. In May of 2006 the vehicle I was riding in was t-boned at a stoplight by a car speeding away from the police at over 70 miles per hour. It took over a year for me to walk straight without pain – which meant about a year without income as a massage therapist. NOW I could see (and be grateful for) the reason behind that August accident …it took away my payments so I wouldn’t have a repossessed car on my credit report during my time of unemployment! These days I practice my Attitude of Gratitude daily(ish). And I honor the small wonders in my life as well as those huge life-changing moments. Maybe what I do might work for you – I’m not a journaler … writing for my two blogs is about all the “journaling” I can make time for most days. Instead I take a few moments, twice a day for Intent-driven Gratitude Sessions. In the morning, before I get out of bed (before the Cocker Spaniels realize that I am awake and they demand my attention) I lie still and say a short prayer to my guiding Powers (God, the Ascended Masters, my Guardian Angels and Mother Earth). Some days I have to really “listen” to each word as this is a standard prayer. If I find my mind wandering during the words, I make myself stop and begin again. My mind is usually ready to GO! at Cocker speed in the morning, so I have to reign it in sometimes! That short prayer is then followed by my thanking my Powers for the day ahead, for my chance to live, to contribute, to partake. I then set some goals: (a) what one thing will I accomplish today in my business? (b) what one thing will I accomplish today in my personal life? After this, I ask my Guiding Powers to help me recognize a moment today to make a difference in someone else’s life. This might be as simple as smiling when I pass a stranger, an uplifting “Good Afternoon!” spoken to someone who returns that smile – it may be the only smile they see that day. Now it’s off to start my day, by this time the Cockers know I’m really awake. My second moment to express my Gratitude is when I lay down at night. I review my day and see if I hit my two goals. If I did, I smile and thank my Powers for being there while I succeeded. If I didn’t I don’t beat myself up – I thank my Powers for allowing me another day to hit those goals. And I look back on the day to see if I was able to recognize a moment to connect with another, to add something to their day. Then it’s off to sleep, grateful for having been given another day to be a part of this world. Do you have a routine to help you keep your Attitude of Gratitude? Let us know in the comments below and allow us to be inspired by YOU! Thank you for visiting, for reading, and for contributing!